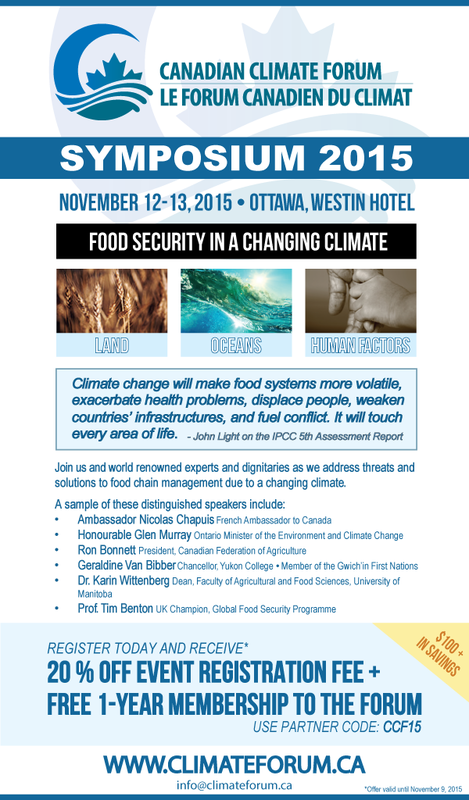 The Canadian Climate Forum is holding their 2015 Symposium November 12th and 13th in Ottawa. Enhance levels of understanding about the impact climate change has on food (and seed) production, distribution, value, and life cycle management. Engage stakeholders from multi-sectors and jurisdictions to share evidence, strategies and solutions. Develop priorities and recommendations for action to help guide decisions and best practices that lead to more sustainable, safe, and nutritious food. ACT is one of the sponsors of this event, and ACT Executive Director Deborah Harford will be moderating one of the sessions. Additionally, ACT’s water policy adviser, Bob Sandford, will be one of the distinguished speakers at this symposium. Bob is also the co-author of ACT’s new book, “The Climate Nexus”, which looks at the nexus between water, food, energy and biodiversity in a changing climate and will be released shortly. If you are in the area November 12-13, check out more information and registration here!